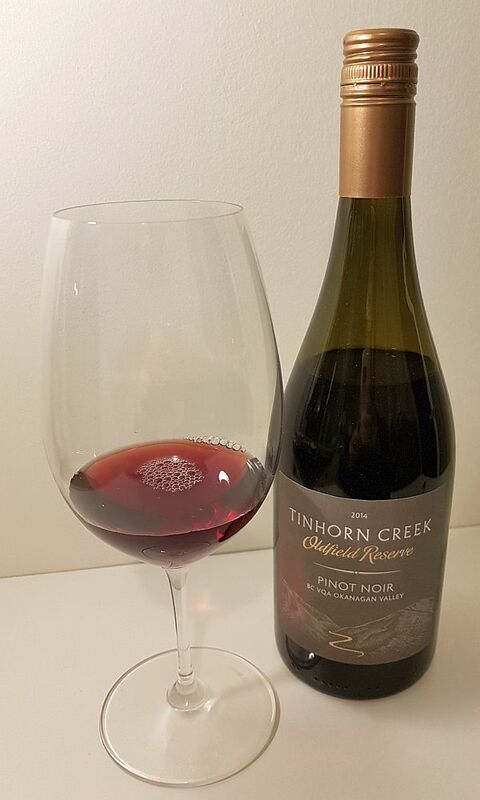 Tinhorn Creek Vineyards in Oliver, BC has been producing quality wines since its inception in the early 1990s. Their primary vineyards are the Diamondback Vineyard on the Black Sage Bench and Tinhorn Creek Vineyard on the Golden Mile Bench. I have been fortunate to have received samples of their latest releases, or upcoming releases, to review for you. The wines all come from these two vineyards. For each of the wines, I’ve included the winemaker, Andrew Windsor‘s description of how the wines were produced as I think that it may help to understand the aromas and flavours of these wines, and better appreciate the amount of effort that was required to produce them. 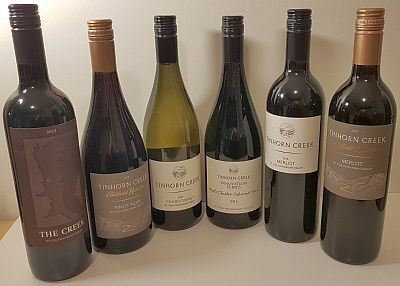 Another thing to note about these wines is that all the wines are under screwcap, even their flagship wine, The Creek, which is wonderful in my opinion. BC wines have great fruit flavours and the screwcap helps to preserve them for your enjoyment. This wine has an intense lemon colour in the glass. A medium intensity nose offering pineapple, vanilla, ripe pears and an edge of sweet spices. The wine is slightly off-dry, soft, medium body, round with a slightly thick buttery mouthfeel. Ripe tropical fruits, pears, red apples, and pineapple flavours. There are also some oak and vanilla flavours to the wine. There is a hint of stonefruit flavours, in particular, ripe peach, that is behind those tropical fruit flavours, and it becomes more evident toward the finish. Long length finishing with light pepperiness, sweet spices and lingering tropical fruit flavours. Very good quality. I did not detect any major differences with decanting, so don’t wait. Rating: – Rich ripe tropical fruits on the nose and palate. Round and mouth-filling flavours. A beautiful pale, crystal clear garnet coloured wine. There may be a slight brickish tinge to it. Medium intensity flavours of red fruits, floral, sweet spices, bramble, cinnamon, with hints of smoke and vanilla. The wine is dry, angular but still some roundness. Medium body and acidity. Red fruit, raspberries, and floral flavours. Oak and pepper on the mid-palate that gets stronger toward the finish. There are also sweet spices which trend toward cinnamon. With decanting the wine loses some of its pepperiness and floral perfume. A longer finish with firmer tannins, lots of pepper, tart red fruits, then raspberry jam and cinnamon at the very end. No need to decant this wine. Rating: – A light smoky red fruit nose, leading to floral, red fruit, and pepper on the palate. A nicely structured wine. A lighter, medium garnet coloured wine, translucent to the core. It has a lighter intensity nose, with a stemmy, capsicum, cedar tones, and red fruits and sweet spice aromas. The wine is dry, medium body/acidity/tannins. Quite flowery on the palate, together with vanilla, cedar, cinnamon, oak, and red fruit flavours. The fine tannins provide good structure to the wine. With decanting the floral perfume reduces a bit and there are more cedar and fewer oak flavours. The wine has a medium plus length finishing dry with flavours of vanilla, milk chocolate, red fruit, cedar and pepperiness. An interesting flavour profile on the finish. With decanting, the vanilla, chocolate and cedar flavours are not evident on the finish. I prefer the undecanted version of this wine. This wine has an overall lightness to it. Rating: A light feeling red wine with floral, cedar, and red fruit aromas and flavours. Elegant. No need to decant. 98% opaque garnet in colour. It has a light intensity, dark fruit and oak nose. With decanting I also picked up a vanilla note. The wine is dry but has a sweet edge to it; fuller bodied and round. Almost silky mouthfeel to start then the tannins assert themselves. The wine has flavours of ripe, juicy red and black fruits, raspberries and plums. Hints of vanilla, cloves, oak and cedar as well. Medium plus length finishing with medium tannins, and flavours of dark ripe berries and oak. No discernable difference to the flavours with decanting. Rating: A more refined Merlot. Fuller bodied wine with ripe juicy red and blackberry flavours, and a touch of vanilla and oak. Good tannic structure. This wine will age well. The wine is a deep garnet colour but is still translucent to the core. Medium intensity nose, showing lees, red fruit, black cherries, and a touch of sweet spices and oak. The wine is dry, roundish with a good tannic structure. 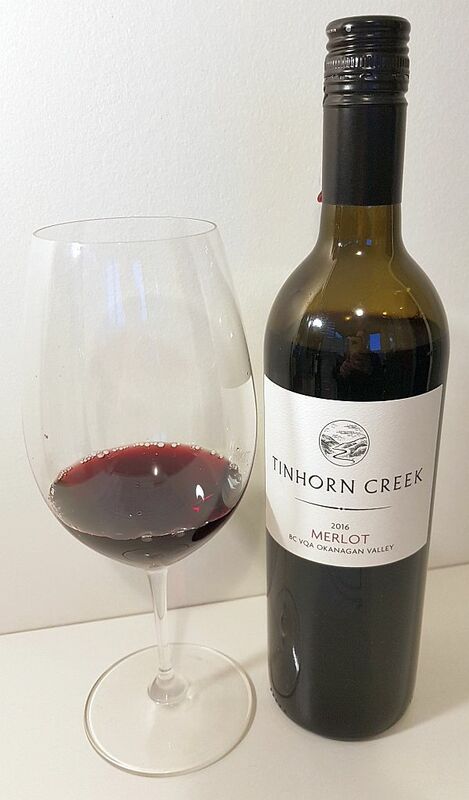 Fuller bodied and full fruit flavoured; ripe berries, raspberries, black and red fruits, and red cherries. Also clove and oak, and a hint of chocolate. Medium plus length, finishing peppery with flavours of red and black fruit and light vanilla, sweet spices and oak. With decanting the aromas were lighter while the flavours stayed the same. I must note that serving this wine at the right temperature is important (as well as for other wines). After opening this wine I kept it in the fridge for a day before taking it out again and warming it up. My first taste of the wine was at 14 degrees Celsius. My fridge is a little cooler and I must have tasted the decanted wine maybe 12 degrees. At that temperature, the oak flavour seemed stronger and the pepperiness was lessened. The wine felt very austere. Letting the wine warm up a few degrees made a big difference, where the fruit flavours were more pronounced and the oak lessened, and the pepperiness reappeared. Rating: – A straight forward, bigger red and black fruited Merlot, with good tannic structure. The Creek is also a special wine for Andrew Moon, their viticulturalist. He joined in 2009 and had to learn about BC’s Golden Mile and Black Sage Bench, which is different from his original home in Australia. To make a flagship wine, he says that you need to work your way up by first improving the vineyards in part through irrigation and canopy management. The varieties in this wine are difficult to grow and took time to figure it out. Their winemaking progressed over time with winemaker Andrew Windsor. The Creek is a Cabernet Sauvignon dominant blend as they felt Cabernet Sauvignon would give them an expression of the Black Sage Bench. 50% minimum will always be Cabernet Sauvignon for The Creek. I had a chance to taste this wine as a barrel sample 2 years ago, and then now as it has been bottled. 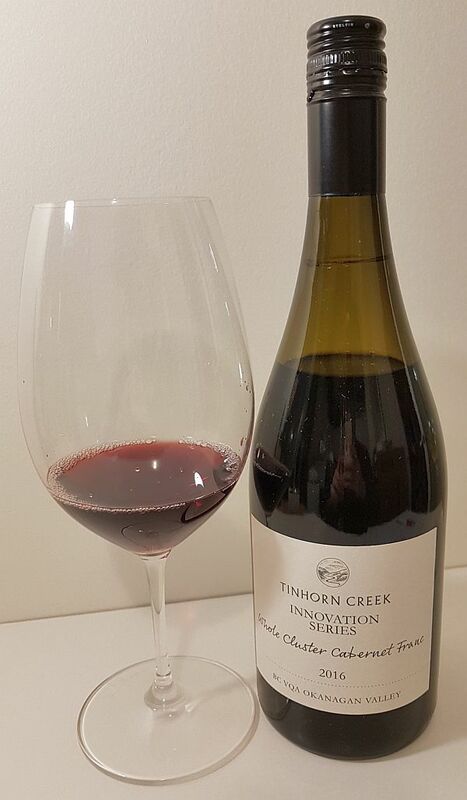 I have both my tasting notes for The Creek 2015 to show how it has changed between the two tastings. I always find it interesting to see how a wine changes with age. 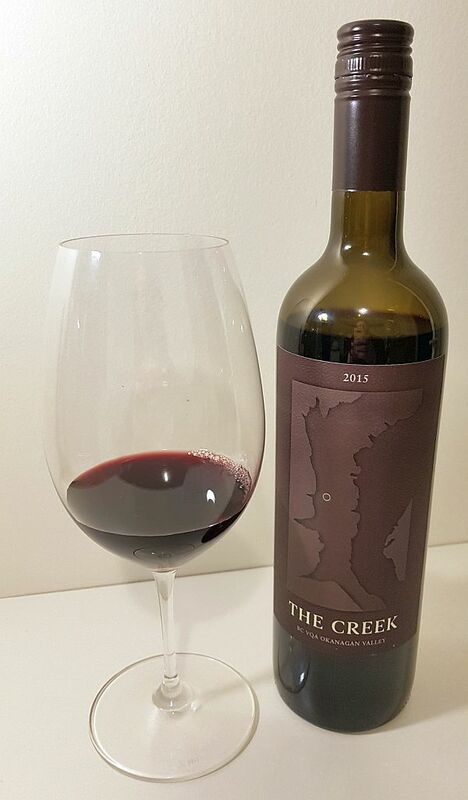 The Creek 2015 is a blend of 50% Cabernet Sauvignon, 20% Merlot, 20% Cabernet Franc, 7% Malbec, and 3% Petit Verdot. 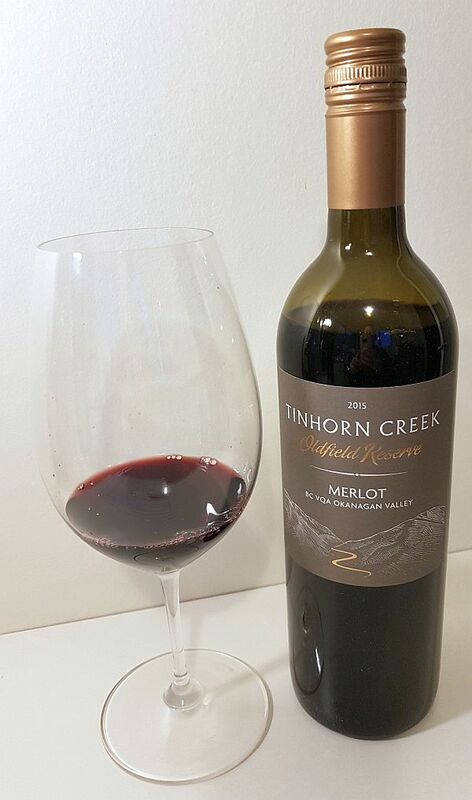 Tinhorn Creek Vineyards The Creek 2015 ($55++) – This wine is 99% opaque garnet in colour. Almost black at the core. Light capsicum/vegetal nose, along with sweet spices, cassis and dark fruit aromas. With decanting you also get light cedar, black cherry, and vanilla aromas. The wine feels slightly off-dry. I checked the specs for this wine and it only has 0.55 g/L of residual sugar, which is quite low. The wine has a fuller mouthfeel, round and supple with fine, soft tannins. Ripe sweet black fruit, cassis, and ripe raspberry flavours, together with hints of capsicum, black cherry, plum, vanilla, tarriness and oak. Very opulent flavours. With decanting you lose the capsicum and raspberry flavours, but pick up some light cedar and milk chocolate flavours. The wine has a long length finishing with mostly ripe sweet black fruit flavours, sweet spices, and very soft tannins. Also a little cedar and red cherry note on the finish. No need to decant. 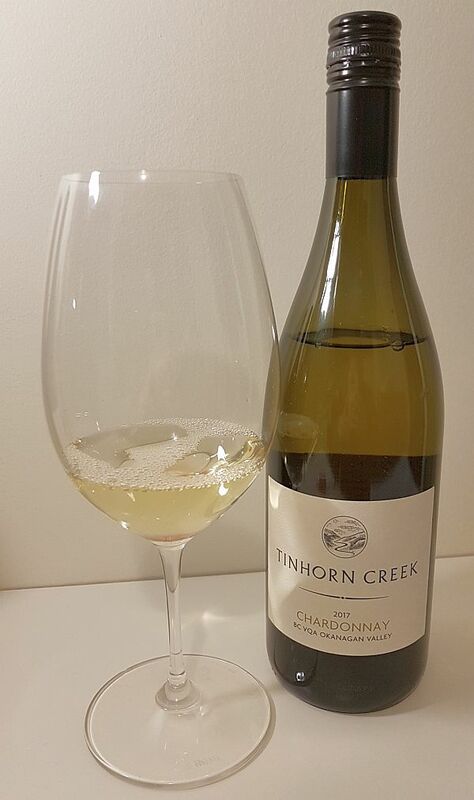 Tinhorn Creek suggests this wine has a cellaring potential of 15-20 years. I think it is too good to wait that long to drink. I would say from now to 10 years would be perfectly fine. Rating: A very high-quality Bordeaux blend, Cabernet Sauvignon dominant. Lots of ripe, sweet black fruit, cassis and sweet spice aromas and flavours, which linger for a long time on the finish. Delicious. You can purchase their wines through their website. Everything Wine and the BC Liquor stores carry a wide selection of their wines. The Innovation Series wines are only available in BC by going to the winery to purchase or enjoy at their Miradoro Restaurant. There will be some bottles available through select agencies in Western Canada.